Anyone using WPLMS 1.9x should wait and not update to 2.0x yet. Not all bugs are fixed and I see many users having problems, just by reading the support forums and the comments over on Envato. I have a vanilla test environment of WPLMS 1.9x on my testserver and i had no problems until 2.0 came along. The last customtypes plugin update today killed the setup completely. Many of the old child themes break or have parts broken. Fresh sample data is not working either. Sadly some of my customers already did an update themselves …. perfect ! Will be a long weekend. 29.01.2016: 2.0.2 – released , tested, a lot of fixes, but its not their yet ! Still having massive problems on a clean system using the modern theme and sample data… 2.0.3 please :) Course section is completely broken now, only shows header and first part of the left sidebar! 30.01.2016: 2.0.2 clean install still failing and not working 100%, checking upgrade install from 1.9.9.1. Clean install with 1.9.9.1 + Sample data is working. Upgrade to 2.0.2 still has bugs and errors. Modern theme is not working! In the past 2 years, the e-Learning market has been exploding. Online Learning Management Systems (LMS) have become very popular, to build e-learning platforms. They not only offer text based content, quizzes, assignment management, course evaluation, social features, but also allow the integration of video, audio and other linked content. Many support SCORM (Sharable Content Object Reference Model), allowing the exchange of learning content and results. In this article I want to share current solutions offered for WordPress. These are standalone plugins, that provide LMS functionality and integrate into your WordPress themes. Ease of integration and options differ. These themes mostly dependent on one of the plugins above or offer only a simple subset of LMS functionality. Integrated solutions, that are supposed to offer a tight integration of WordPress, theme and its own plugins. 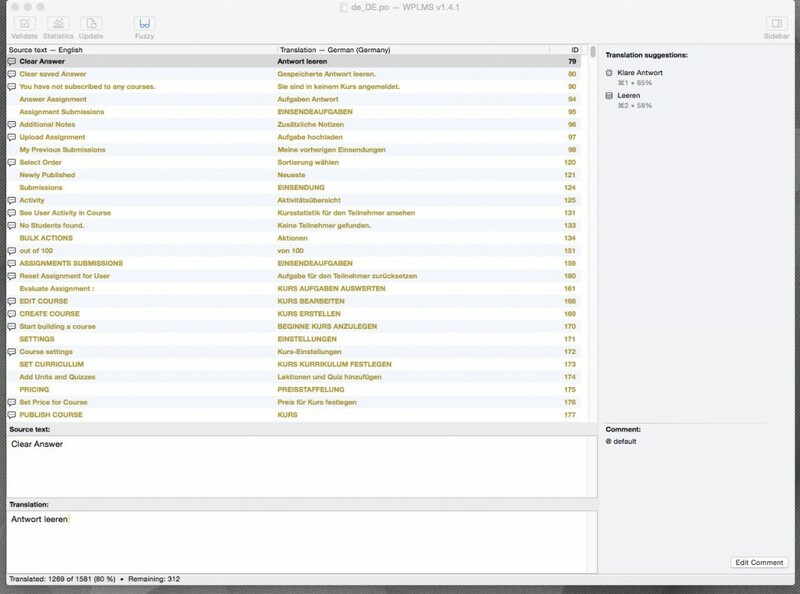 One thing that sets WPLMS apart from many of the above is the frontend interface. So instructor tasks happen on the frontend not in the WP Admin. Also when it comes to assignments, WPLMS is currently the best solution. Even if the assignment management is not yet perfect, its better than what many of the other solutions offer. I am currently working on a WPLMS enhancement for a customer, that allows to simplify the payout of instructor commissions. The whole system runs on the MyCred Points System and students pay for courses with Points. The problem is how to easily payout the instructor commissions via PayPal. There is currently no addon for MyCred available that does that magic, so I build one myself. At the moment the payment process via PayPal is completely manual, due to budget constraints. I am basically generating a custom “Send Money” link that prefills the PayPal email and amount to send. 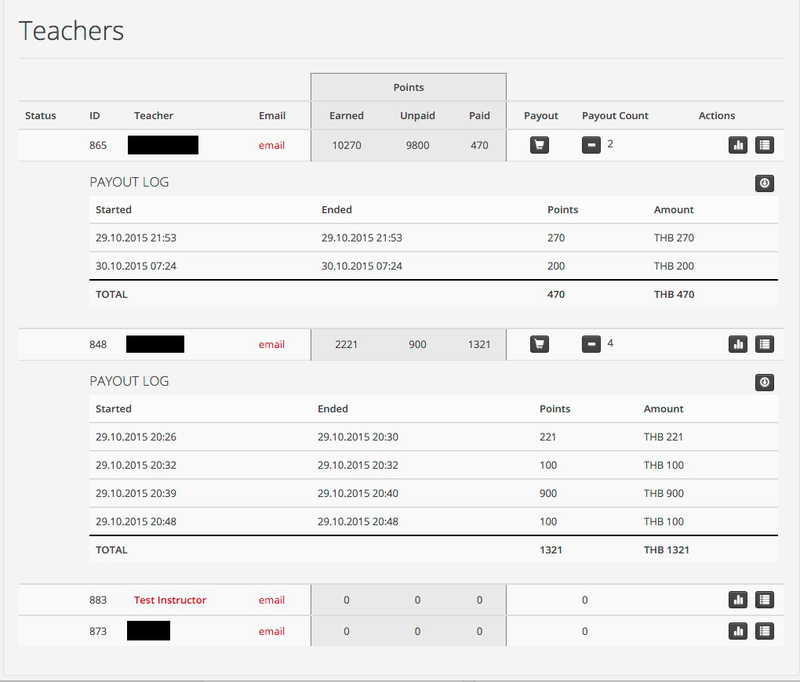 The interface itself handles the payout sessions, tracks the instructor balance, paid and unpaid points. This list the instructors and their point balance and allows to start the payment process. Payout sessions make sure, that only one session can be started per instructor, as the instructor could earn new points during the process. 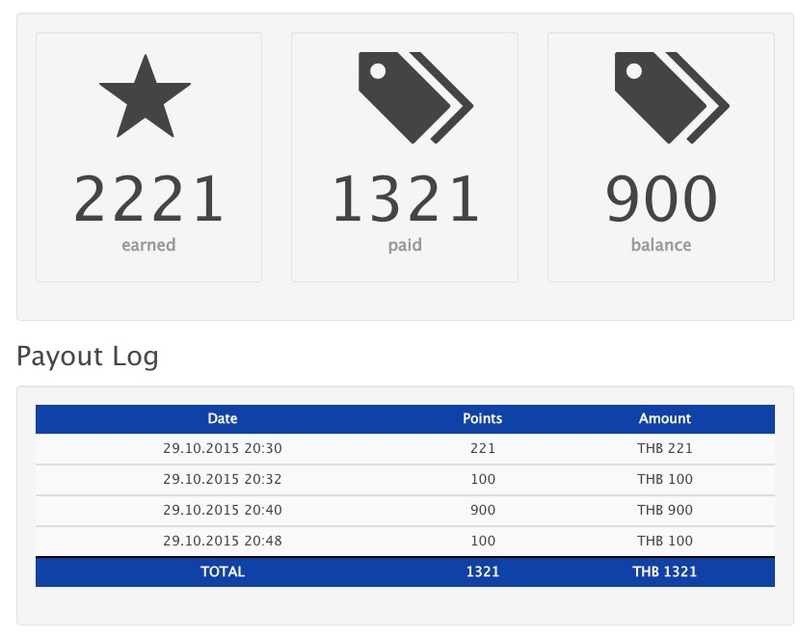 The points converted can be changed, allowing you to payout a fixed amount of points. Its a 3 step process. Login at PayPal. Open the “Send money” dialog and send money to instructor. 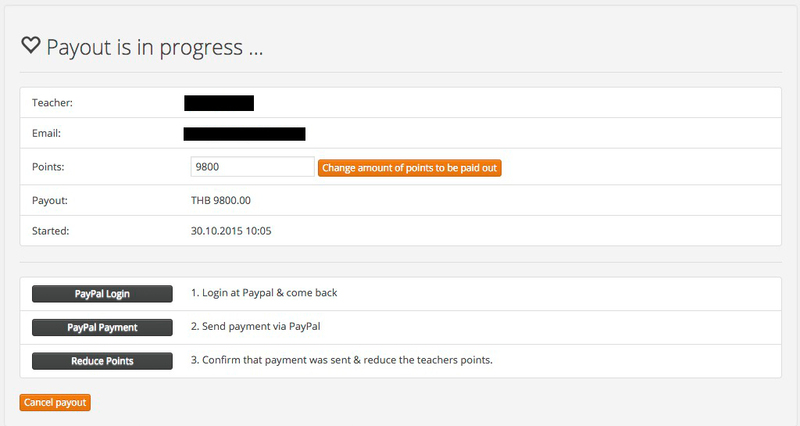 Confirm that you manually send the money and than register the payment and payout points in the system. The session can be cancelled at any point. You can also leave the session open and continue at a later point. On the frontend I added an interface to the BuddyPress Profile, that allows the instructor to track his payouts and balance. The whole setup could be updated using PayPal Adaptive Payments, to make the whole process completely automated. Something to consider for the future :) Pretty happy with the manual process so far and it will be a great help for my customer to keep track of the commission payouts. The whole setup is currently targeted for WPLMS, but can easily be adapted to other setups using the MyCred Points System. I am working on an Addon for WPLMS to automate some of the manual tasks. Will extend the list, as things progress. 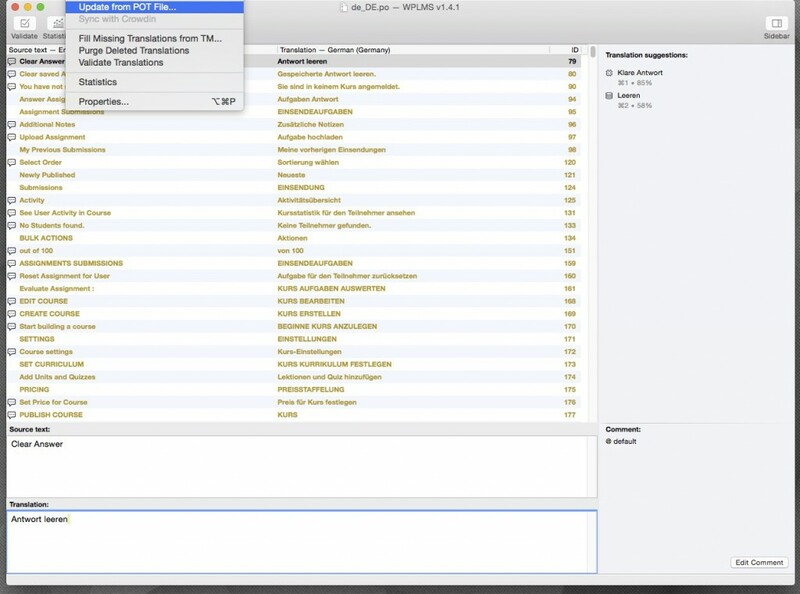 These language files will be overwritten with new files on every update, destroying any custom translation changes. Move your theme into a child theme and translate your theme there (/wp-content/themes/your-child-theme/languages/). 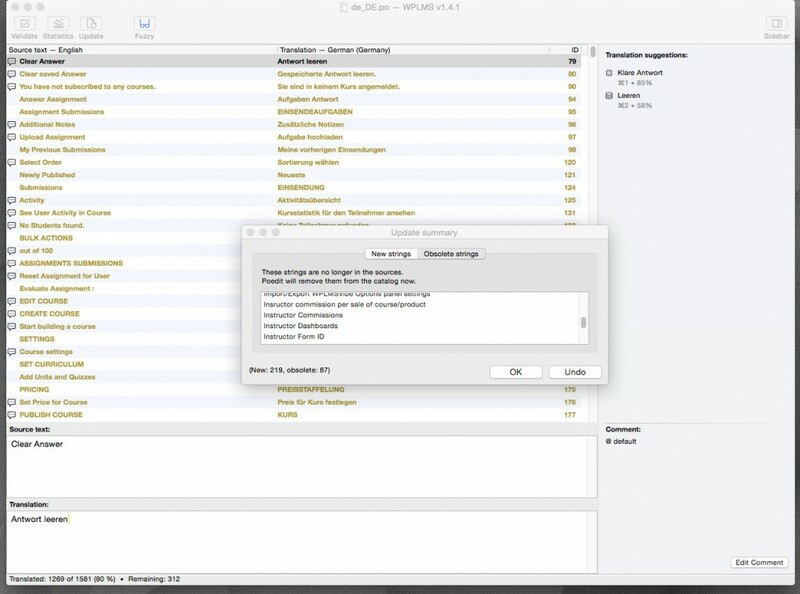 Make sure that language files are loaded from your child theme. Add the following action to your functions.php and use “vibe” as the domain, not the actual theme name. This will check for new or obsolete strings and update your language file. 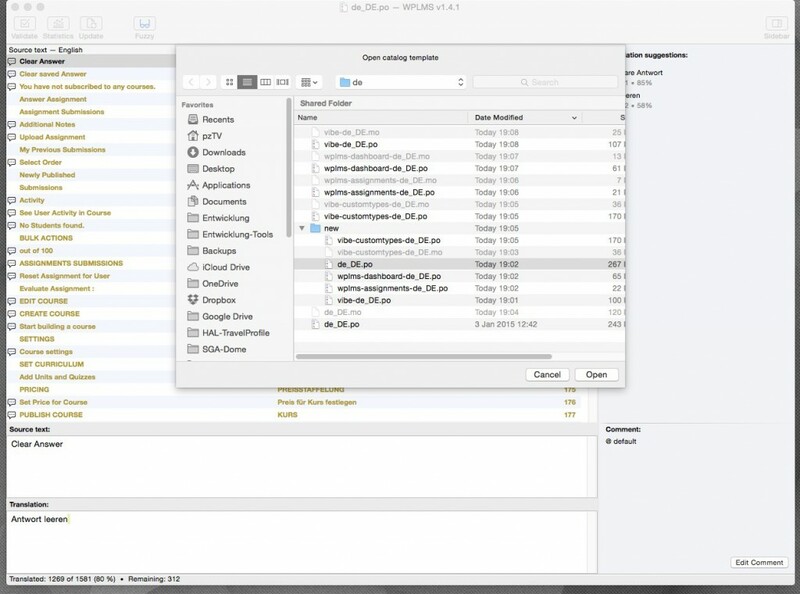 G. Save and upload updated .PO + .MO files from target structure to server. Again, make sure to use the global language folder and the child theme languages folder !